The Republican National Convention kicks off this week just a few days after the party's presumptive nominee Donald Trump named Indiana Gov. Mike Pence to the bottom of his ticket. After the GOP meets in Ohio, it's the Democrats' turn in Philadelphia, where the result of the convention is expected to be just as predictable (though Hillary Clinton's VP pick is still up in the air). For many Americans, the conventions this week and next week are the cementation of a tough reality, when they will officially have to make the choice between the lesser of two evils in November. But that resigned predetermination simply isn't the case — you need to pay attention to Jill Stein because she's your ticket out of the two-party system. Stein has been on the back burner for most of the election, but now that Bernie Sanders has officially endorsed Clinton, it's time to bring Stein into the limelight. Sanders and Stein match on 99 percent of issues according to the ISideWith.com quiz, so if you're a Berner who is crushed by his Clinton endorsement, don't hesitate to switch camps now. Although Stein's Green Party affiliation puts her climate change plan at the center of her platform, she's no less invested in or vocal on social issues like police brutality, income inequality, LGBTQIA+ rights, and free education. She's just as progressive a candidate as Sanders (and even falls to the left of him on Israeli-Palestinian relations), and she can be an overnight contender if the progressive left comes together to make it happen. 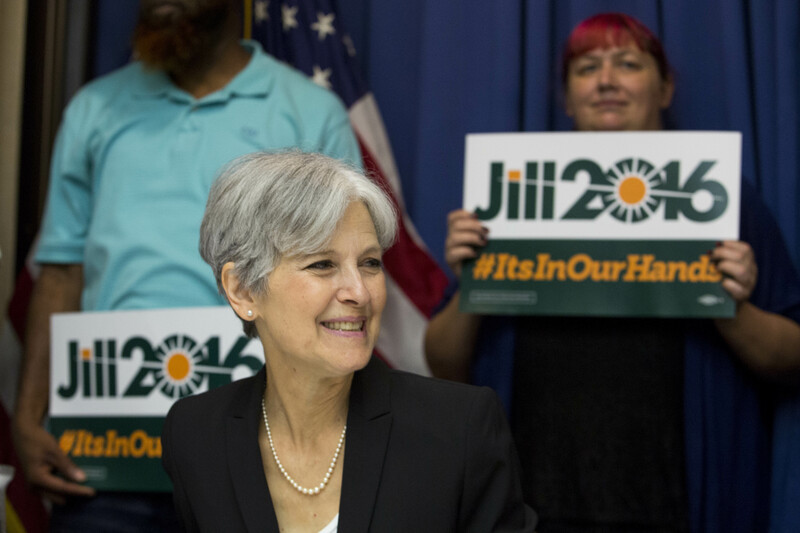 Stein might also be the solution to the two-party system that's been plaguing the country since the days of Thomas Jefferson and Alexander Hamilton. No one can deny that partisanship is taking a major toll on the efficacy of the federal government, and the two-party system perpetuates the bitter rivalry between the parties that leads to a lot of the inaction. With a third party in play, the whole game changes, and Congress might actually be able to focus on issues and legislation than the partisan game of politics. If Stein's Green Party can come through in the presidential election and some congressional elections, the political trajectory of the United States would start to change instantly, something most people can agree the country needs. If the thought of voting for Clinton or Trump makes your stomach turn, get serious about a third party candidate. There's still time to turn this election into one that the country can be proud of, with a candidate that more people actually like than dislike. Stein could legitimately win the presidency, without the backing of a major party or the name recognition — it's the freedom and power of the people to accomplish that that makes America so great. All that's left to do is exercise that right and make it come true.